I received my Ipsy April Glam Bag yesterday in the mail and while I am not pleased with the color variation of the nail polish this is a really good bag yet again! I wish I would have been sent the hair powder instead of the Soy Renewal (since I have the full size of this product and have used it for many years now) but none the less it will get used at some point not sure when though because this stuff lasts a long time. I really like the makeup bag this month it feels fresh and the inside lining was a nice touch! Like I said I have used this product for years and really like it so much so that I have the full size bottle. You can see my previous review on this product here. I'm really not feeling this color and mainly because I am so pale against my skin it just doesn't look right. I swatched my thumb with this and wasn't inclined to share it because it looked just plain bad with my skin tone. It wasn't even mannequin hands it was like oompa loompa finger tips I do think this shade would be lovely on anyone who isn't as pale as paper however. I received Sweet Cheeks and I'm quite happy with the color it's a medium pink with a shimmer that give it a kind of peachy tone. It is very well pigmented and good quality I would say. I received the Mica eye shadow in Earth and it is really sparkly so much so that even with the swatch I had a lot of fallout. Good news is some scotch tape took care of that easily and quickly. I really like the shade even with the fallout and I'm sure I'll put it to good use! There we have the Ipsy Glam Bag for April 2013 again I wish I would have been sent the Powder Play instead of the Soy Renewal and the other color nail polish but it was still a good bag! 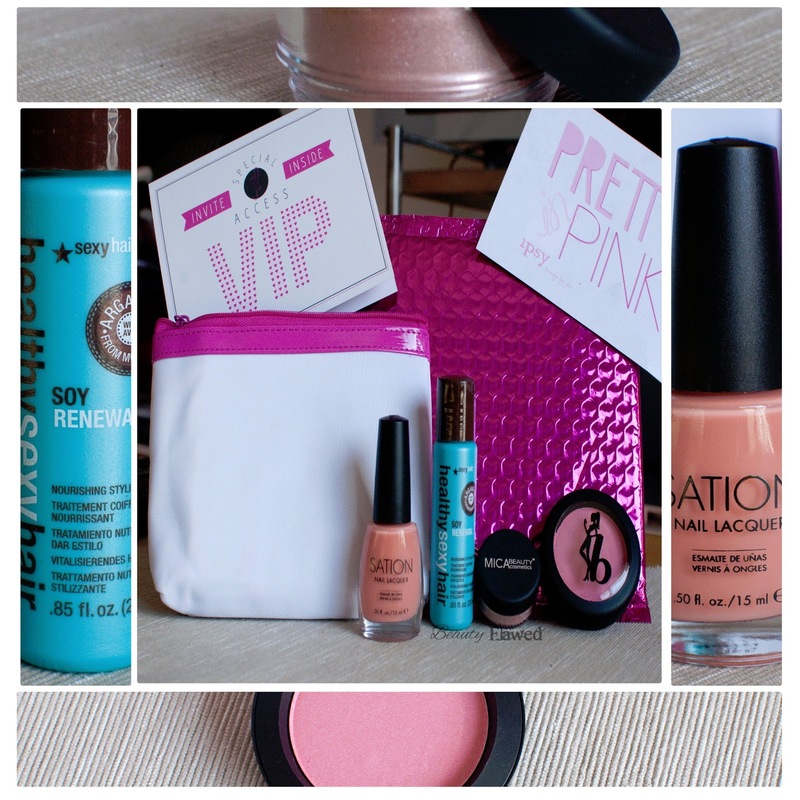 What do you think of the April 2013 Ipsy Glam Bag? I was really happy with the bag this month. I received the same one as you and was excited for the blush! Yea Im really liking the blush it's really pigmented but blends out really nicely. Looks okay...but that nail polish is a bummer. :P I would have liked a bubblegum shade better! Agreed the bubblegum shade is much cuter! I love the eyeshadow! Such a pretty color! I can't seem to keep myself away from a sparkly bronze color. Yes I am really happy with the color it's perfect! It is really nice I hope you get your bag asap! Great bag! Sorry you don't like the nail polish. Maybe you can give it away. I would love to see you do a makeup tutorial with some of this neat stuff you receive monthly.